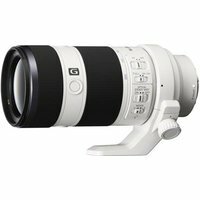 The Sony 70-200mm f2.8 G SSM II Lens is designed exclusively for Sony's digital SLRs with Sony A-mount and is the ideal lens for portraiture, sports and wildlife photography. The lens offers a bright f2.8 maximum aperture for excellent light gathering throughout the focal range. According to Sony, this version II lens is 4x faster, quieter and with quicker AF performance than the previous model. Optical performance is further enhanced with the addition of Sony's Nano AR coating that suppresses internal reflections for outstanding clarity and contrast.